As leaf shapes among the Alocasia species go, this particular one is hard to beat. 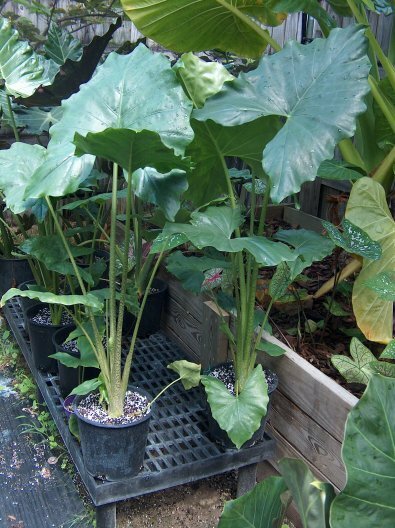 Although it is a challenging plant to grow, this Alocasia is well worth your effort if you have a warm greenhouse and can give your plant the attention it needs . . .
Alocasia advincula is one of those plants with looks strange enough that if you were feverish and slogging through a rain forest and stumbled upon it, you might think you were hallucinating. 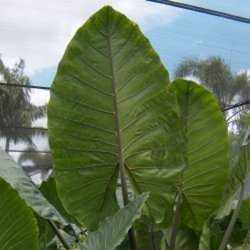 Most Alocasia leaves have the posterior lobes smaller than the main part of the blade, but this plant has posterior lobes that are actually longer than the main portion of the blade. This, plus the coarsely sinuate leaf margins, make for a decidedly exotic look that is not seen frequently in aroids. To top it off, the petioles on this plant are intricately patterned, somewhat reminiscent of something reptilian. In 2003, a fellow by the name of Tony Advincula found this plant in Capiz Province of the Philippines. The plant was named informally in his honor as he was the one who brought it to Manila. This is fascinating when you think that we are already in the 21st century, and yet it is still possible to find something truly unique and unknown in the jungle. A. advincula was first shown in January 2003 at the annual garden show of the Philippine Horticultural Society. When this plant was shown in the U. S. A. at the annual International Aroid Society show in the Fall of 2003, it was an instant sensation. However, growers have discovered that keeping this one alive and healthy requires very tropical conditions. Cool weather will send the plant right into dormancy if you are lucky, or into the compost pile if you aren't! 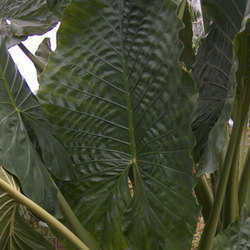 The Batwing Alocasia has dark green, somewhat fleshy leaves on long petioles (see thumbnail picture above, right). Those petioles can be somewhat to very mottled or patterned, and this coloration can be seen in the peduncles of the inflorescences as well. In addition to requiring warm day and night temperatures, the plant grows better if the soil medium is kept on the dry side and does best if grown in shade. Full sun can burn the leaves and make the Batwing more susceptible to leaf spot disease and other rots. Based on my experience, I do not recommend planting this one out in your garden as you would other terrestrial Alocasia species. The Batwing should be fertilized lightly only when it is actively growing. See Alocasia advincula "Batwing" for more pictures of the leaves and inflorescences. As an Alocasia hybridizer, I wanted to develop a plant with the looks of this one, but that could be grown as easily as Alocasia odora or Alocasia macrorrhizos 'Borneo Giant'. So naturally I attempted crosses using pollen from the Batwing placed on inflorescences of both of those plants. I was successful in both crosses, although the hybrid that has leaf shapes closest to the "batwing" shape is the one involving the Borneo Giant. These plants are still maturing as I write this, but they are certainly much easier to grow ,and tolerant of a wider range of growing conditions, than is A. advincula. A couple of the seedlings are shown in the picture at left. Note that one has more prominent petiole coloration than the other; this can also be seen in clones of A. advincula. The ones shown here are from the cross involving A. macrorrhizos 'Borneo Giant'. For now, I've chosen to name these new plants Alocasia 'Pterodactylian'. 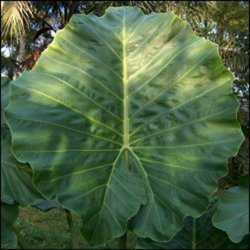 While Alocasia advincula is known commonly as "Batwing Alocasia" or "Batman", it is not the plant that is known as the "Bat flower". That plant, Tacca chantrieri is in a completely different family and not related to the Batwing Alocasia.